One prophet Rufus Fala of the Ak spiritual Christian church, Makgodu, Limpopo in the north eastern area of South Africa, who was reported something's ago to have being using wired things for acclaimed healing and deliverance for his church members is back with a new style. 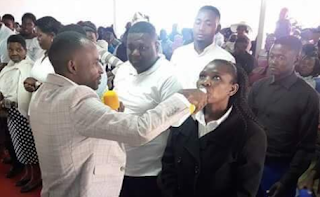 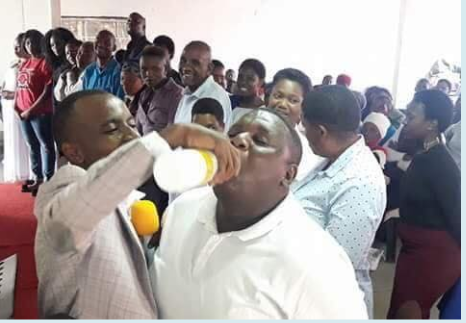 The prophet gave been pictured this giving his church members detol, Jik house hold bleach to drink during last week Sunday service for the sake of miracle healing. 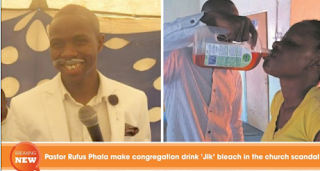 The prophet also claims he knows it is dangerous to drink detol but God has asked him to use, adding that he has started receiving testimonies from people via whatsapp that it is working although many have reported the case to police because it had affected many after drinking it. However, the police have being said to be investigating the matter after some laid complains of being affected after drinking it.